Even as the Dow neared its all-time high this July of 14,000, it was really only worth 9,730! It's true, as the Europeans perceive the value. The dollar has depreciated so dramatically in the past seven years that essentially Europeans are buying into the Dow and other U.S. capital markets at incredibly cheap prices. Consider back in October 2000 when the dollar was at a high and the euro was worth just 82 cents for every greenback. Since then — and largely due to massive inflation of the U.S. currency — the dollar has fallen some 39 percent. Today it takes $1.36 to buy a single euro. So, in terms of euros measured in value with the start year 1999, the Dow was worth just 9,730 compared to 14,000 in U.S. dollars. Understanding the depreciation of the dollar gives investors a better idea why the U.S. market has been able to pull off a record bull market close in July. This is part of a long trend where the U.S. markets have been pushed up in value as huge sums of foreign — not U.S. investor funds — have flowed into New York Stock Exchange (NYSE) stocks and other U.S. equity markets. 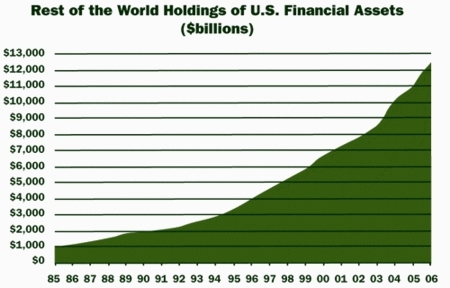 The chart below shows the massive growth, in asset value, of foreign holdings in U.S. financial assets. The importance of these foreign inflows has also helped sustain our debt markets and has been critical to keeping the rates of U.S. debt instruments low. These low rates have, in turn, sustained the recent economic boom. Low rates also have played a role in making the equity markets buoyant and rising. When the Dow hit records in July, overall the index was up a remarkable 27 percent during the past year. Barron's, in an article titled, "The Missing Man," noted the fact that it was the first bull market that did not include small individual investors. In fact, during this bull market, net inflows from foreigners have been huge. Reuters reported just weeks ago, citing the U.S. Treasury, that "Net overall capital inflows into the United States rose to $105.9 billion in May, with corporate bond and equities purchases driving long-term monthly investments to a record high." The result of such inflows is that the U.S. has become increasingly dependent on foreigners to underwrite our debt and to keep our capital markets robust. So far, this seems to be working because the dollar is considered extremely cheap, thanks to the Federal Reserve, which has inflated the currency. Today, the U.S. is in a tenuous position. If it moves to strengthen the dollar, it could scare away such foreign inflows. At the same time, it needs the inflows to keep the economic tide rising. Nevertheless, Americans will wake up one day to find out that foreigners are not only buying the nation's silver, they have bought our china, dining room set, kitchen, and maybe the whole house. How could this happen to the lone superpower, the mightiest country on earth? I have been reading a new book, "Are We Rome? The Fall of an Empire and the Fate of America" by Cullen Murphy, which offers some insights into the rise and fall of the great ancient empire and the parallels to America's current global predicament. For sure our empire is not a territorial one like the Romans. Instead we have built a commercial and cultural empire that rivals Rome's political reach. As Murphy explains in his excellent book, Rome in its last days became dependent for tribute in the form of taxes (that often came in the form of food or other commodities) from its tributary states. America too has become dependent on a new form of tribute, foreign capital inflows to buy our stocks and underwrite our debt. But unlike the mighty Roman Empire, we cannot enforce payment. Thus we are at their mercy. So what the Europeans and other global investors "giveth," they can also "taketh away." This may explain the recent fall in equity prices and the sudden increase in the cost of debt that are reducing underwritings.